Ruthanne, rear-facing in Cosco Scenera. Ruthanne is 1 year, 8 months old, 28lbs and still rearfacing in the Cosco Scenera. She was moved into it when her brother took over the Marathon so he could be harnessed again and to give her 2 extra pounds of rearfacing. She will be kept rearfacing till she reaches the limits of the seat. 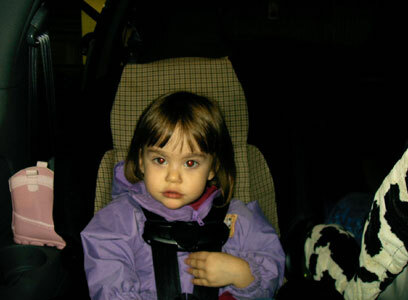 Ruthanne rear-facing in the Britax Marathon at 1 year, 7 months old.